This morning I continue on with the Fruits of the Spirit; those things which should be evident in our lives if we have the indwelling of the Holy Spirit. Peace. So far with each of these fruit I've started my study with a search of the Bible for mentions of the fruit I'm looking to understand. Last week I found that without God there is no true joy, and whenever there is joy God is there. Peace has been ... complicated. A lot of mentions of peace are in regard to peace offerings. 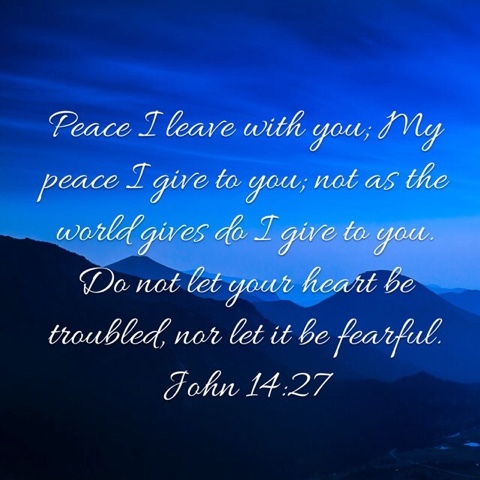 These were given to God before we were given the Holy Spirit, but nothing is wasted so I felt a better understand of what a peace offering was is in order. A peace offering wasn't in atonement for a sin. It could also be called a "thank" offering. It was a way of giving back to God from what He had provided, from a thankful heart rather than a guilty one. At least one online commentary suggested this to be the most satisfying kind of offering to God because it did not involve sin. It is also an offering which fed the priests and gave back to the one giving the animal. A portion went to God, a portion to the priest and his family, and a portion went back to the giver. It was a form of fellowship between God, the intercessor, and His children. Peace is also mentioned frequently in greeting, especially when angels or resurrected Jesus Christ are appearing. God is awesome, and something about His presence, even through another, is frightening. But He wants us to be in peace. He isn't a Zeus-like god, waiting to hurl lightening bolts at us and laying bait to trip us up. 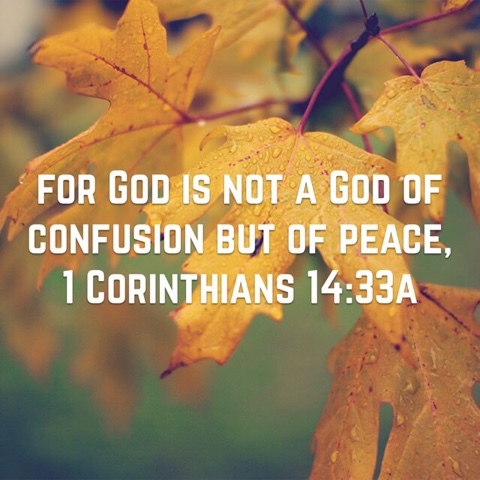 He is a God of peace. He gave His son to die so that we could have a relationship with us because He loves us. Jesus is referred to in prophecy as the Prince of Peace, which would make God, His Father, the King of Peace. 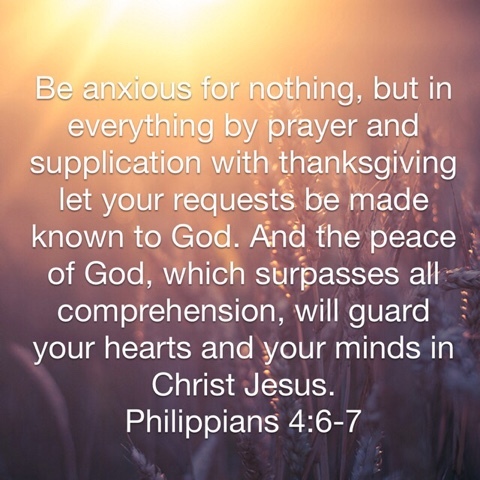 When we feel confusion, worry, and anxiety ... 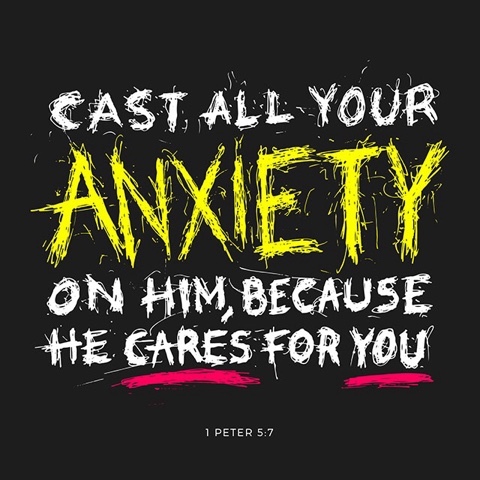 He wants us to stop carrying that burden and lay it at His feet so we can carry His peace instead. Not His wallet. Not His insurance card. Not His bank statement. 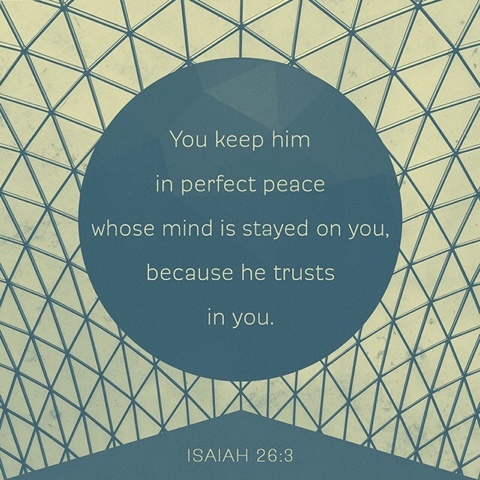 None of the things we tend to think will grant us a good night's sleep ... simply His peace. How? How do we come to enjoy His peace? Instead of relying on the comforts and securities of the world we have to rely on Him. How can we do that if we don't know Him? Time and again He invites us not to worry but instead to trust Him. It isn't easy, especially in our culture of comfort. It takes practice. I've heard it argued that exhibiting the fruit of the Spirit should be easy, but I heartily disagree. We have to get ourselves out of the way first. I've found "self" to be a strong and tenacious opponent. Praise God He is PATIENT with His children. Why would peace be important? 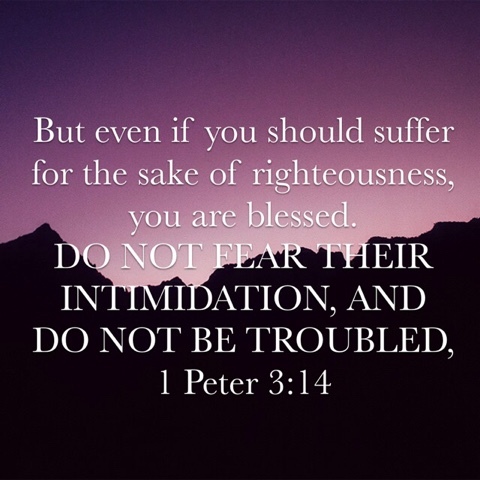 If we are serving and living for the God of peace, it doesn't represent Him in our lives to go about wringing our hands and quarreling does it? Is He really Lord of our lives if that is what we are doing? 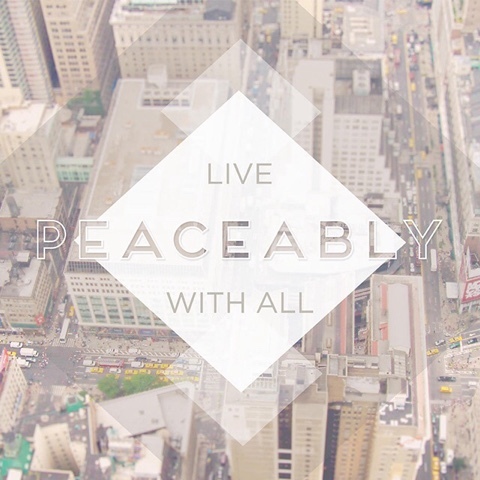 You better believe it isn't easy to live at peace with everyone, but the Bible instructs us to do it again and again. So on top of the peace from God that quiets our anxious minds ... God asks us to extend that peace to others. Since He is the source there is more than enough to go around. 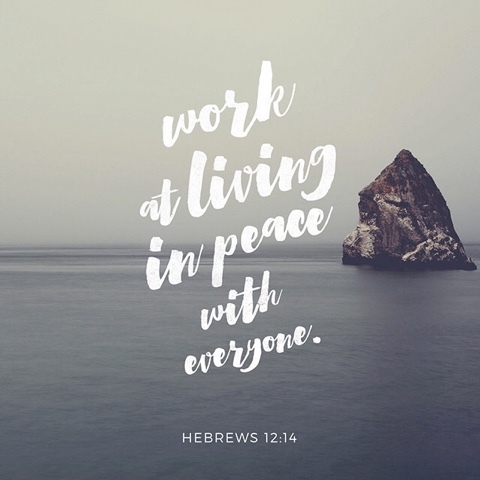 Even if we are exhibiting God's peace to the world and extending it to others, it doesn't mean our lives will be peaceful. In fact, God tells us that when we follow Him there WILL be trouble. Not there might be trouble. Not some of you will experience trouble. There will be trouble. 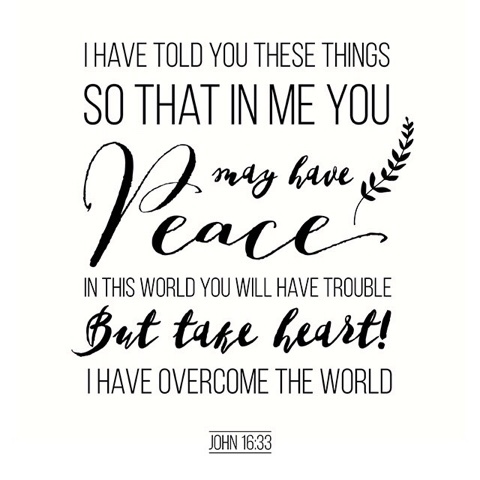 And even in troubling circumstances He remains the God of peace. He is Lord of all, and if we are to be troubled for His sake, it is a blessing and to His glory. As time marches on Christians will see more trouble, not less. I won't pretend to understand a lot of prophecy, but that part is crystal clear. It will not be easy. And yet we can still have peace. Peace beyond understanding. Beyond comprehension. Peace of the martyrs. Women who have stood for their faith in the One True God while watching their children die. Men and women who have been lit afire and refuse to renounce His name, who even praise Him as they are consumed. Jesus crying victory even as He died on the cross. It is finished. We can take courage that when all is finished, and everything in this world will come to an end, the Lord is victorious. The King of Peace is on His throne. We know how it all ends. So accept His peace and be generous with it to others. Only the Holy Spirit can give that kind of peace.